First Line: " The earth and all her layers sped past while I traveled to the surface." 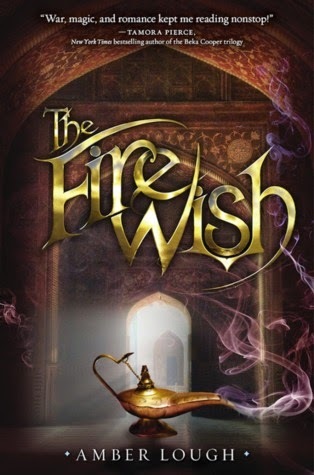 Review: I always get so excited and have such high hopes for books that have to do with the mythology of the Jinn, which is why The Fire Wish has been a book I have eagerly anticipated since I heard about it, and I'm not going to lie the book did not live up to the expectations I built up for it but I still liked it for what it was. Lough gave us a little background information on how the Jinn people in the world she created came to be and in The Fire Wish apparently it was a human named Iblis who helped a fallen angel and the angel gifted him with the gift of "wish power" (what I do know of the actual facts in this case the origin of where this book is based Iblis is known as Satan who is one of the Jinn). I have a ton of questions in regards to that, I don't know I'm really confused in which way the author was trying to go with all of that and since nothing was further explained in depth it's left a lot of unanswered questions. The world building was done very well I was able to picture everything in my head from the palace in the human world in which Najwa was thrust into to the world in which Zayele unexpectedly put herself in with the Jinn. As far as our two main protagonist, overall I loved them. With Zayele my emotions were mixed, one minute I loved her the next I didn't. In the beginning when we meet her I loved her, for a girl growing up in the middle east to be so strong and outspoken it was a rarity so I loved her but then the way at times she could be so self centered and do what she did to Najwa that caused both their worlds to turn upside down I hated her ...but then she redeemed herself later on and grew as a person and I loved her again. As for Najwa I liked her from the beginning seeing how she is the first one we meet, the only thing that I wanted from her was to stand up for herself more often especially against a couple of secondary characters that we meet along the way in her world. The girls were actually the complete opposites of what I expected. I figured Zayele would be the demure and guarded girl instead Najwa was and Zayele was what I would expect out of a jinni. There was romance in The Fire Wish and I was really looking forward to reading about it but I ended up not being a fan of it at all. It was the case of insta-love with both girls. I also would have liked both Atish and Kamal's characters to be more well developed besides Kamal being the prince and a bit of a nerd I didn't feel like I got to know him and someone who is the prince living in the times where the jinn and humans are at war must have more to him then what we learned. As for Atish same goes for him he is a soldier I get that but I want to know more about him. If the guys are going to be a huge part of the girls life then I want to feel connected to them as well. I did find the book to be actually a very simple read, a book based in the middle east I expected a little bit more rawness to it this could have easily been almost a middle grade book. There were lots of twists and a huge reveal which I didn't find too surprising since I had guessed it early on so I found things to be a little predictable. Overall I did have my issues with The Fire Wish and even though I did like it I don't think I will be picking up the second book since it didn't pique my interest enough to do so.